This shimmering Solitaire is the universal go-to piece that looks perfect with everything from a work suit to a little black dress or red-carpet-style party. 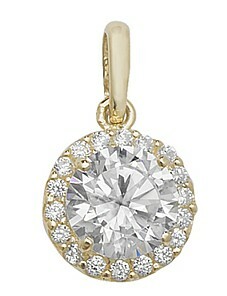 At the centre sits a dazzling CZ solitaire and this is bordered by 20 tiny CZs. All set in 9ct gold and threaded on a gold chain. Actual size: 1.5cm.